I am a believer that good things should be shared..unless they are in limited supply (like my last serving of almonds I hid behind the self raising flour this morning..). 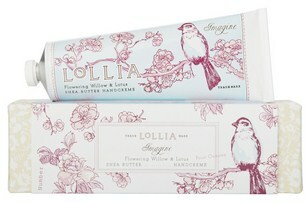 So I must SHOUT out to all those who care that I am in love with Lollia by Margot Elena handcreme. The love affair started when mum bought herself a tube at the Chelsea Markets in New York last year (name drop). She then bought me one online for my birthday, another one for herself and then discovered the perfume range! Mum did a lot of hunting into where it could be bought in Australia with a little luck. Now just last Sunday while window shopping in downtown Osaka, I happened to walk straight up to it in a bath and body boutique! I don't know whether it was the memory of that gentle coconut, jasmin and mandarine creme pictured above, the sweet and innocent floral tube design, or just the fact that I had found a piece of mum in Japan, but I had to buy one. I chose BELIEVE - cabbage rose & citrus. Mostly because it reminded me of Anne Shirley asking if a rose could smell as sweet if it was called a 'skunk cabbage':p BuSeriosuly thought, this one smells so summery and scrumptious! I wish I could just put in on a vanilla muffin and eat it!